To pass information between two apps, you need to create two flows, one the opposite of the other. The action of one flow will trigger the other and vice versa. If done incorrectly this causes a flow loop, an endless loop of duplicated information. A flow loop can also happen if the action from a flow causes the trigger for the same flow. For example, when an email is received in Zoho Mail, an email is sent in response, and this triggers the flow again. Suppose you have a flow where, when a project is created in Zoho Projects, it creates a new board in Trello. To keep both apps updated, you have another flow that is the reverse of this. Make sure both flows' triggers have at least one field that you have control over. For example, you can control a project's title but not its automatically assigned ID. Click Logic in the flow builder and drag the Decision block onto the builder between your trigger and action. Set the decision to run only if the field from step 1 contains a particular word. 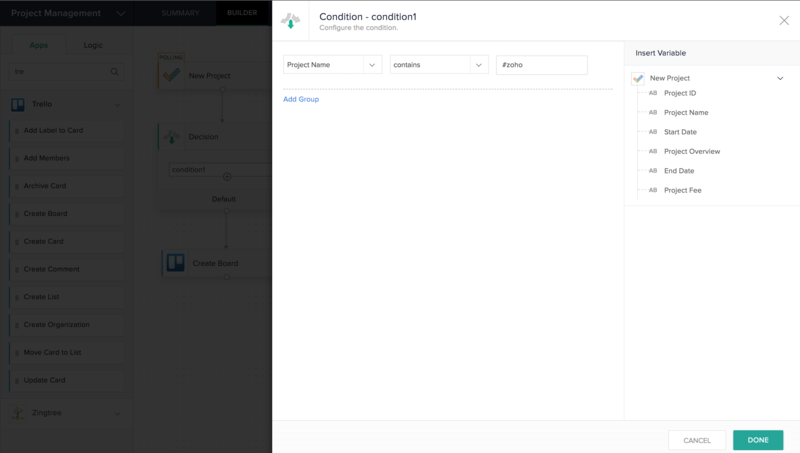 For example, you could configure your flow to only run if a project has #zoho in the title. Whenever you create a project, remember to use your keyword. Repeat the directions from step 2 in your reverse flow, but make sure you alter the decision logic to execute on a different keyword. Now when one of your flows executes, the decision logic will prevent the other flow from executing.